With 2018 in the books, the real estate community can set its sights on the year ahead, which should rank in the top three years of all time in terms of units sold in the area. With a little luck and a big push, it could set the record. Whatever the count, it will be close. One thing for certain is it will not be as volatile and unpredictable as the stock market, and perhaps not as profitable. But it may fare better. No one knows. Most current Realtors are heavily invested in real estate, many in the Airbnb movement, where the income is unfathomable in some of these properties. The issue with ownership of Airbnb properties is the possibility of more regulation by the Metro Council. As of this writing, it is difficult to predict what the Federal Reserve will do with interest rates with the current chairman is under fire from President Trump. Based on the activity over the past year, those who incur his ire are usually fired and replaced by “acting” chairmen, directors, etc. The current chairman, Jerome “Jay” Powell, has led a Fed that increased interest rates four times in 2018, the latest coming Dec. 19. The previous three hikes had no substantial impact on the housing market in Nashville, although there has been a slight decrease in new construction sales nationwide. Locally, 2019 should be business as usual in Nashville, continuing a trend that started in 2012 when the area began its recovery from the Great Recession. However, politics could once again play a role as the market is at the mercy of the state’s General Assembly, which is not always in agreement with Metro Council. If they clash, and the council loses, so will Nashville. The local economy is robust with local businesses reporting their best year ever. As most of the data collected here is anecdotal and from sources that are not providing hard data, a non-scientific check on restaurants, retail, goods and services from locally owned businesses all mentioned record sales, and most were in the 12 percent to 15 percent increase over last year. All ahead full steam in 2019. With its recent surge in new construction, Nashville architecture has blossomed and added more diversity, at least inasmuch as there are more contemporary homes being constructed than ever before. The recently sold house at 2000 Earlington Drive is set in suburban Forest Hills on a stretch that runs the true, original architectural gamut. Listing agent Stephanie Tipton Soper says the house was built in 1960 and is set on a .98-acre lot. Soper is with Zeitlin Sotheby’s International Realty’s Belle Meade office and recently sold 2016 Earlington Drive for $2,188,009, among her bevy of recent luxury home sales. Park’s stalwart Ivy Arnold, who represented the buyer, says the residence reminded said buyer of the house where he had spent his childhood years. Like the seller of 2016 Earlington, the buyer of 2000 Earlington is a music business executive and represents several recording artists. 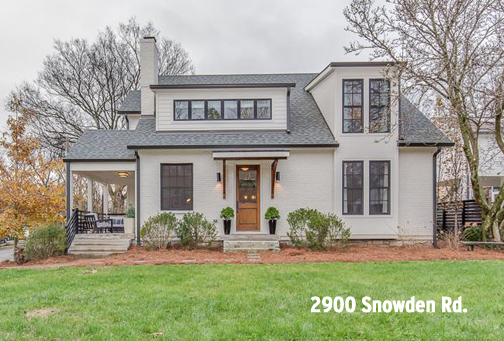 The neighbors can look for legendary architect Nick Dryden to make his distinctive mark on the home over the next few years, just as he did the new Earlington owner’s home at 2900 Snowden in the 12South area. While she is more skilled in realty than zoology, Arnold knows a unicorn when she sees one. The Dryden creation on Snowden can be found on all of the favorite real estate sites with Realtracs being the most accurate and timely, as it always has been.